Every week, Food52's Senior Editor Kristen Miglore is unearthing recipes that are nothing short of genius. 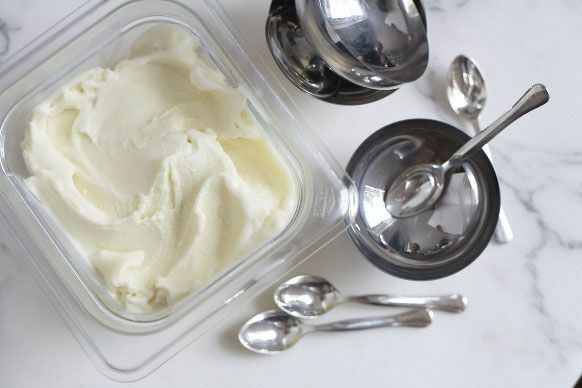 Today, a blueprint for the smoothest, most scoopable ice cream -- no yolks allowed. Back in the olden days before this summer, it seemed the only way to lock down a smooth, scoopable, re-freezable homemade ice cream was to get eggs involved and make a proper custard. This is fine, when you're up for willing egg yolks not to scramble and ice cream that always seems to taste a bit like French Vanilla. At some point in the fifteen years she's been making and selling ice cream, Bauer realized that an eggy custard base has a nasty habit of muting other flavors. 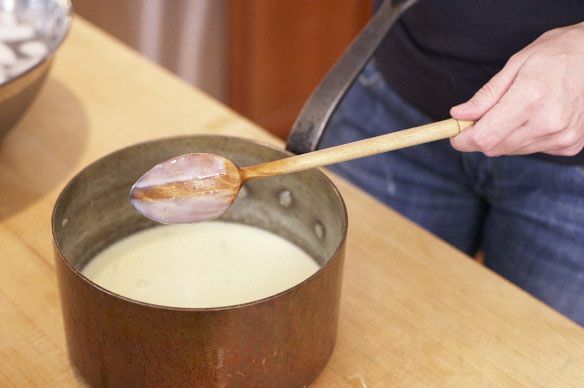 Here's why: The butterfat in cream will melt and bloom as soon as it hits your tongue -- loud and clear, you're tasting roasted pistachio, dark chocolate, or cognac. Egg yolk fat isn't so quick on the uptake. It sits on your tongue and gets in the way. Yolk is great and all -- for enriching a hollandaise or painting on a pie crust -- but here, it acts like some washed up lounge act with the real talent just left to hum and sway in the background. So Bauer kicked the diva to the curb and developed a formula to put the butterfat in charge while keeping gritty ice crystals at bay too -- all with the help of readily available baking aisle staples. 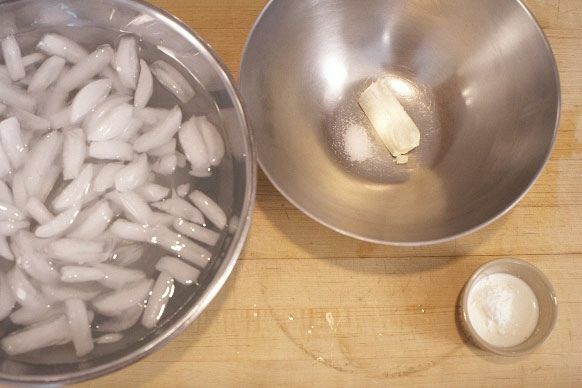 Most of her recipes start with the same comforting step, prepping three bowls (see above, left): a lump of soft cream cheese whisked with salt; a cornstarch and milk slurry; and an ice bath, with a sturdy Ziploc bag bobbing in it, waiting to cool down your base fast, fast, fast. This is like food chemistry lab for preschoolers. "You can do this," say the three bowls. Because once you have them lined up, you're halfway to ice cream. The Sweet Corn Ice Cream with pockets of Black Raspberry Sauce alone is worth buying the book, the ice cream maker, the corn, and the berries before summer fades (Anti-ice cream maker? Saveur has a few workarounds). The Basil with Honeyed Pine Nuts is confusing and delightful, and only a little bit like pesto candy. The Salty Caramel is as life-affirming as it sounds. But Bauer's genius is also in giving you tools: she provides the blueprint, plus the science behind it in digestible form, so you can go your own way with brittles and infusions and variegates, like she has. Dolling up her basic formula for ice cream (or frozen yogurt) can be as simple as steeping a vanilla bean or making a lemon syrup, or as complicated as you like. Cones, marshmallows, caramelized white chocolate freckles; they're all within reach. All Fritos aside, below you'll find the blueprint, and a simple Lemon Cream Ice Cream. It will charm you any time of year, from the stickiest last days of summer to the peak of winter citrus season: it's racy yet mellow, clean yet rich -- and show-stopping, in a way egg yolks would never stand for. From Jeni's Splendid Ice Creams at Home by Jeni Britton Bauer. Want more genius recipes? Try Alice Waters' Ratatouille or Ian Knauer's Sticky Balsamic Ribs. 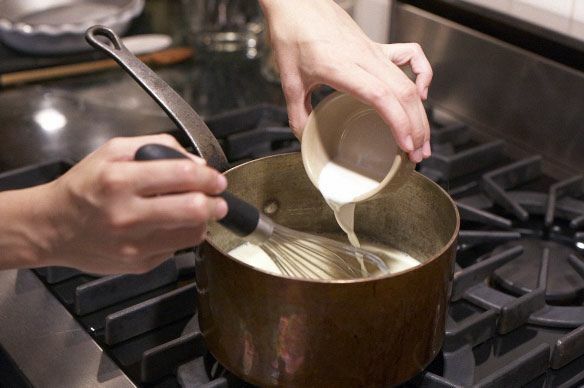 Add lemon juice, zest and sugar to cream (or half and half) to taste (maybe six lemons to two cups of cream). Stir until the sugar dissolves. 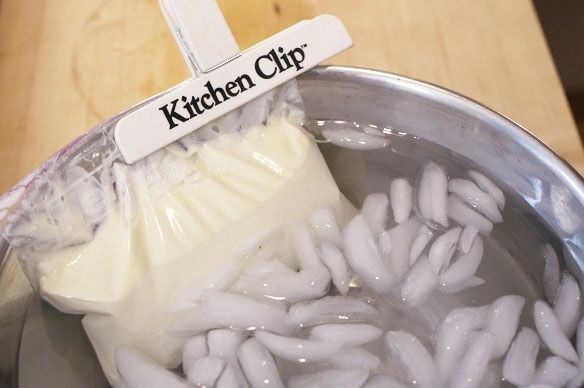 Put into anything you want and pop into the freezer. That's it. Icier than with a machine, but heavenly if you've got Meyer lemons! Have made many homemade ice creams, and this was among the best. As per other comments below, left the base in the fridge overnight to chill, and the texture was still outstanding. 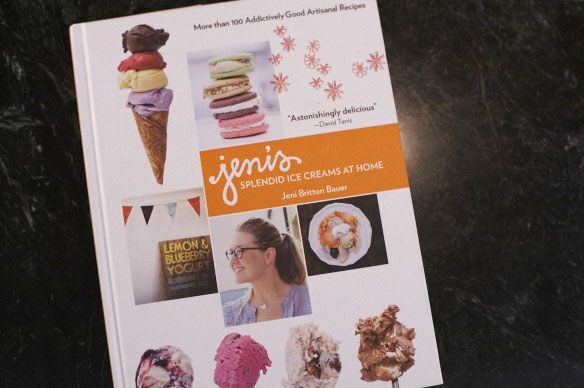 I use the inexpensive Cuisinart ice cream maker - I believe it's the one Jeni recommends in her book? Instead of lemon, did key lime - sublime! Depth of flavor, firm, scoop-able texture, no iciness - this will be my new ice cream base from now on. Come on down to Nashville, Kristen. We'll show your tastebuds a real good time. This is so remarkable to me. I was born and raised in Columbus. 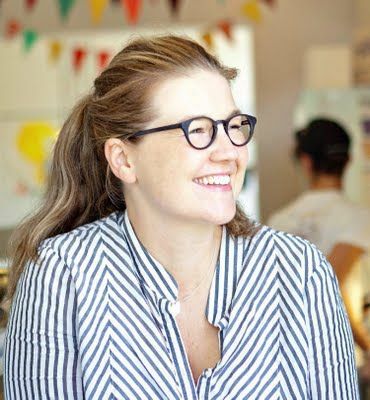 I remember (though perhaps Jeni doesn't want me to remember - I just want to point out how wonderful her success story is) the first time that Jeni opened a stall at the North Market, and it failed. What a long way she has come, and what deserved recognition. For many years I owned and operated a little store in the Short North part of Columbus, just a few doors down from one of her locations. In the winter her staff would deliver a french press to all of us shop-keeps to warm us up, and in the summer they always came around with little samples of new flavors. It is such a thrill to see Columbus getting on the food map. It may be a small midwestern town, but it sure has some darn fine food! 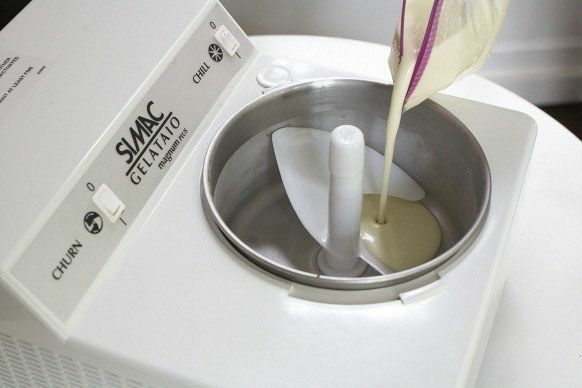 Any recommendations for home ice cream makers -- under $500? I have a Cuisinart I bought from Sur La Table and it works great. Does Antonella have a favorite ice cream maker to recommend? I have been making Jeni's frozen yogurt, with gelatin and just a touch of corn syrup, and it is truly the best ever. I tried it with a swirl of passionfruit curd and it was deeply divine! This is my favorite cookbook of the summer. I've made the roasted cherry goat cheese and the the sweet corn black raspberry - both were wonderful. Sticky notes are marking the lemon ice cream and the salty caramel, and a dozen more. Question for the pros: Typically I'll make my ice cream base, leave it in the fridge to cool overnight and freeze it the next day. Is there some baking-chemistry reason that I couldn't do this with these (fabulous sounding) eggless-varieties? BTW, I've added her book to my wish list at Amazon, it will be mine! I haven't made this ice cream, but I've made others with cornstarch instead of eggs and leaving the mixture to refrigerate overnight works just fine. I'm not sure about the chemistry involved, but I've saved this very ice cream base in the bridge for a couple days before freezing with no ill effects. In the fridge, rather. I do not recommend storing the bases in a bridge. Unless that bridge is below 40° F.
Jeni's is one reason I'm sorry we no longer live in Columbus. Yup, Jeni's really is the best! This is so great! I just tried my hand at ice cream for the first time last week, and I am hooked. I can't wait to get this book and make every flavor. Amanda's olive oil gelato is also in the queue. Thanks for featuring this, Kristen. This is truly genius. Amanda's gelato is unbelievably good (just be sure to use great-tasting olive oil). I've made Jeni's lemon cream. It's as wonderful as Kristen says. Her lemon-blueberry yogurt is superb too. Eating my way through her book. I must admit though, I still love egg yolk ice creams - especially the ones by David Leibowitz. That's Lebovitz - sorry David! I love this book! First I made the salty carmel two weeks ago. It seemed that everyone in town must be trying to make Jeni's splendid ice creams because my local Whole Foods was sold out of corn syrup, heavy cream, and 1 gallon freezer bags! 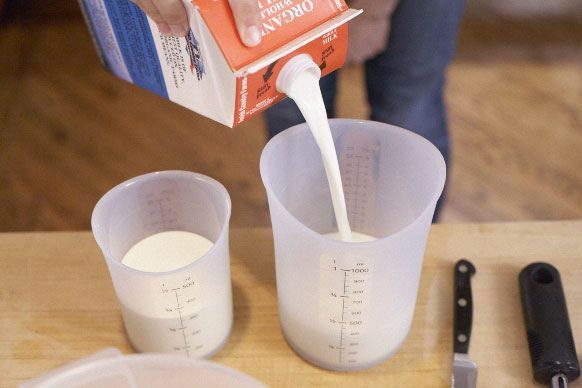 I persevered with half and half for both the milk and the cream, and agave for the corn syrup. The results were splendid. Egg yolk as a washed-up lounge act? You crack me up, Kristen. I've been so tempted to buy this book and I don't even own an ice cream maker, though Saveur's makeshift ones look interesting. Ditto, Midge :) The book is a very happy one, with lots of profiles on her suppliers and hand-written details. I went to school in Columbus, and I love love love Jeni's. I'm so glad she's getting so much buzz. She's a great proponent of using wonderful local Ohio ingredients. I think I'm going to have to make a trip to Columbus (or Nashville) to really get the whole picture.